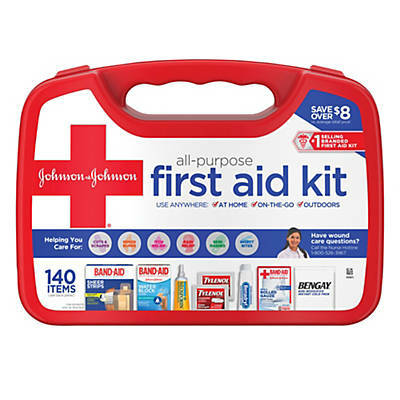 Clean, treat, protect, and care for cuts, scrapes, minor burns, itches, pain, skin rashes and insect bites with the JOHNSON & JOHNSON RED CROSS® All Purpose First Aid Kit. 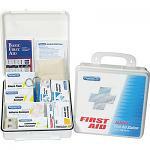 This versatile kit contains 140 first aid essentials, including cleansing wipes, gauze pads, antibiotic ointment with pain relief, itch stopping cream, acetaminophen caplets, an instant cold pack, bandages, non-stick pads, rolled gauze, and much more. The kit includes products from leading, doctor-recommended brands, including BAND-AID®Brand Adhesive Bandages for covering cuts and scrapes, NEOSPORIN® for antibiotic protection, TYLENOL® for relieving pain, and BENGAY® for topical analgesia. Two pairs of nitrile patient examination gloves help you ensure proper aseptic technique, while the JOHNSON & JOHNSON First Aid Guide offers helpful instruction.